To make the digital sewing factory a reality, Dürkopp Adler has developed the QONDAC NETWORKS, production monitoring system that links up to 1500 sewing machines in a network, analyzes productivity and status of each machine and enables remote maintenance access. Is the sewing production in time? Why are some machines faster than similar others? Only if you have real-time online data of your sewing machines to generate prompt answers, you can react and save a lot of time and cost. Optimization potentials can be detected easily in a dashboard with customizable key performance indicators. In case of problems, automatic alarm messages are sent to technicians or managers. Software updates, video tutorials and maintenance instructions can be transferred via internet. Interfaces to ERP systems like SAP or others will be available. This first real Industry 4.0 product for sewing machines is easy to install, fulfills highest security standards and will be hosted by one of the most reliable brands in the industry. 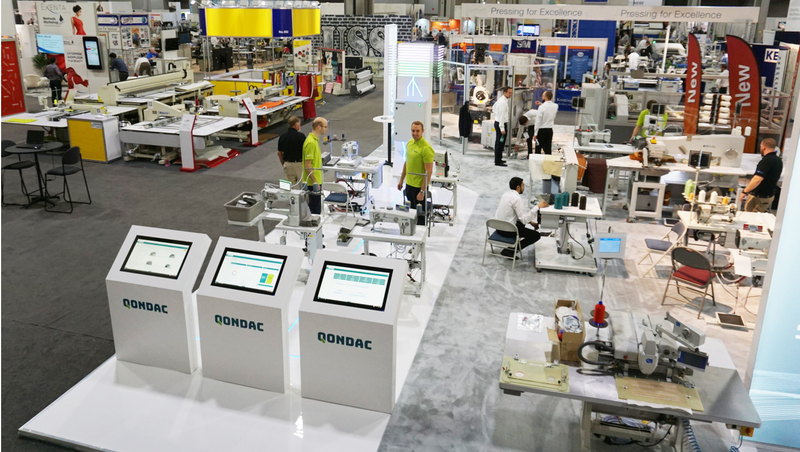 Consequently, visitors paid great attention to the sales launch of QONDAC, the IoT networks platform for textile machines from Dürkopp Adler. Dürkopp Adler releases QONDAC network solutions for sale at Texprocess Americas in May 2018. The biggest European manufacturer of industrial sewing technology connects entire plants with own QONDAC high-tech servers, even crossing country borders. By real-time analysis of the gathered machine data, the availability of machines, the production performance and the quality of the resulting product can be significantly increased. Customers especially liked the possibility to connect not only Dürkopp Adler machines but also all other machines in a factory by sensor technology or open access interfaces to enable central monitoring of the whole production process. Industrial sewing machines like the M-TYPE PREMIUM lockstitch machine or the brand new pocket welting sewing unit class 756 can be adjusted centrally from the server, and maintenance processes can be digitized based on real usage. Connections to ERP systems are developed, too. Perfectly combining to that, Dürkopp Adler has also launched the new smart touch control panel QONDAC Commander CSP on the Texprocess Americas. The panel for M-TYPE PREMIUM machines can show on-demand HD videos and HTML pages and enables new communication options to the central QONDAC server. This innovation will be introduced step-by-step to other machines of the ShangGong Group, mother company of Dürkopp Adler AG. Dürkopp Adler has developed the QONDAC NETWORKS, a real-time production monitoring system for sewn product industry.